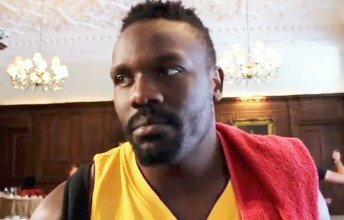 Dereck Chisora says he’ll smash up Edmund Gerber to win the European Heavyweight title and then wants one of the all-reigning Klitschko brothers. The Finchley ace faces Gerber for the vacant title and will also put his WBO International title on the line at the Copper Box Arena on Saturday 21st September on a multi-title extravaganza featuring alongside British stars Billy Joe Saunders, John Ryder, Frankie Gavin and Paul Butler. ‘Del Boy’ is back on the road to challenge for the world heavyweight crown with back-to-back KO wins over Hector Alfredo Avila in April and unbeaten American Malik Scott in July. A stunning win over Gerber will put the 29-year-old back in contention for a showdown against WBO/WBA/IBF king Wladimir Klitschko – who faces unbeaten Alexander Povetkin next month – or a rematch against his brother, WBC champion Vitali, who Chisora pushed all the way in February 2012 only to lose on the scorecards. Tough German Gerber has won 23 fights with 14 KO’s and his sole loss was on points to Michael Sprott last December. He has fought in Britain before, stopping Colin McKenna in the opening round with a body shot at the M.E.N Arena in November 2010, but former British and Commonwealth Champion Chisora is a big step up for him. “Beating Gerber is another step closer to the Klitschko brothers and nothing is going to stop me winning the European title,” stormed Chisora.